Posted Sunday, Oct 27, 2013 8:16 PM EDT by HAMILTON SPECTATOR & filed under Cancer. Today we look at breast cancer, the second-leading cause of cancer deaths in women in Hamilton. From 2000 to 2009, nearly 3,400 women in Hamilton were diagnosed with breast cancer and approximately 920 women died from the disease. 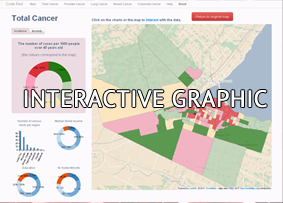 The rate of breast cancer deaths in the former City of Hamilton is approximately 16 per cent higher than the comparable rate for the rest of Canada. The incidence of breast cancer in the former City of Hamilton was 3.5 per cent lower than it was in the five suburbs of Stoney Creek, Ancaster, Dundas, Flamborough and Glanbrook between 2000 and 2009. But the breast cancer death rate in the former City of Hamilton was more than 7 per cent higher than the five suburbs averaged together. Worst: The neighbourhood between Queen Street North and James Street North from Cannon Street to the rail line north of Barton Street had the highest rate of breast cancer incidence. Between 2000 and 2009, there were 52.8 new breast cancer cases for every 1,000 women ages 45 and older. That’s 80 per cent higher than the Canadian rate. Best: The neighbourhood bounded by Chedmac Drive, San Pedro Drive, the Mountain brow and Rice Avenue had the lowest rate of incidence, with 15.4 new breast cancer cases for every 1,000 women ages 45 and older. 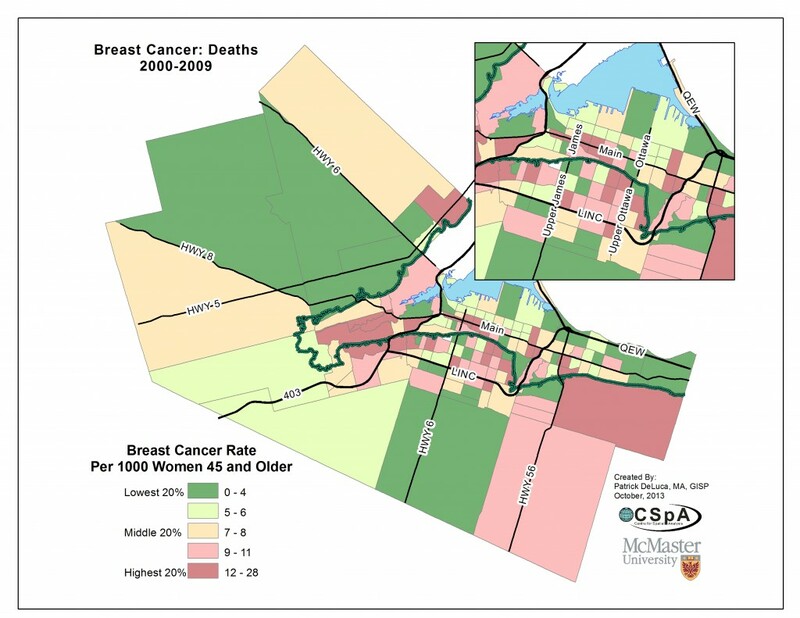 Worst: The neighbourhood between James Street South and Wellington Street South from King Street East to Hunter Street had the highest rate of breast cancer mortality, with 27.7 deaths per 1,000 women ages 45 and older — nearly four times higher than the Canadian rate. 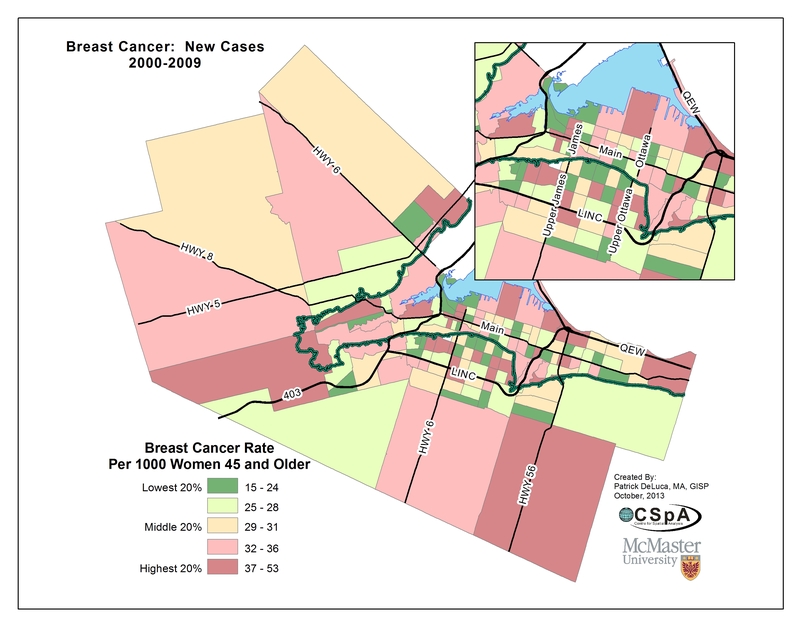 Best: The east Mountain neighbourhood bounded by Upper James Street, Rymal Road East, Upper Gage Avenue and the Glanbrook border, as well as the neighbourhood bounded by Chedmac Drive, San Pedro Drive, the Mountain brow and Rice Avenue both had no breast cancer deaths between 2000 and 2009. Women who drink alcohol regularly have a 25 to 30 per cent greater chance of developing breast cancer than nondrinkers. Oral contraceptive use and hormone replacement therapy for menopause each increase the risk of breast cancer by more than 20 per cent. A family history involving certain hereditary genetic mutations is also responsible for a significant number of breast cancers. Women with the BRCA1 mutation have an estimated 55 to 65 per cent chance of developing breast cancer by age 70, while those with the BRCA2 mutation have an estimated 45 to 49 per cent chance of developing breast cancer by age 70. Environment: Current research suggests that a person’s physical environment — such as exposure to certain chemicals — might play a role in getting breast cancer, but the specific chemicals and biological mechanisms are not yet well understood. A British agency estimates that as many as 500 breast cancer patients in Great Britain die each year because they stop taking life-saving medication due to the side-effects they suffer. Women with a certain type of breast cancer are often prescribed a five-year course of the drug tamoxifen, which dramatically improves the chance of survival. But a survey showed that a number of breast cancer patients don’t finish the course of treatment because they can’t tolerate the sometimes serious side-effects of nausea, headaches, joint pain and fatigue.